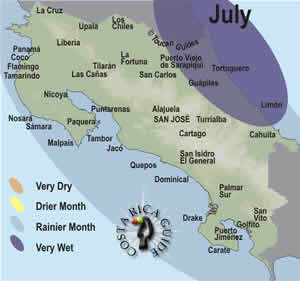 Costa Rica July rainfall patterns. It’s the rainy season across the country but mostly in the afternoons and evenings or overnight. Best Time to Travel – Low Season? A few years ago only insiders traveled to Costa Rica in July, but the secret is out so we’ve started recommending planing ahead and making advance reservations. July and August have nothing like the crowds during the peak season weeks of Christmas/New Years and Easter but it’s lively along the popular routes. Bright sunny mornings heat up the ocean and rain forest canopy loading the air near the surface with water and causing it to rise. As the moisture laden air climbs it expands and cools condensing out droplets that form clouds and eventually rain. This pattern dominates the Costa Rican wet season from May through November and July is no exception. Still, it’s a great time to visit with hot sunny mornings to enjoy the beach and afternoon and evening rains cooling it off so you can enjoy a meal al fresco. Although it is the middle of the rainy season Costa Rica typically experiences a short mid-year mini-dry season in July and the beginning of August. Rainfall decreases significantly for three or four weeks especially in the northern Pacific. Ticos call this the veranillo or little summer and you can read about how it occurs here. As noted above out of all the rainy season months July is usually a bit drier than the rest, but occasionally it’s very wet. 2007 was a record breaker with rainfalls nearly double the average in some regions of the north and northeast that washed out dozens of bridges. Five vacationers died in flash flooding while rappelling a waterfall in the mountains and another was struck by lightning and died while swimming in the Pacific. The Caribbean side is solidly in the rainy season and heavy rain is common. June and July 2015 were very wet on the Caribbean as the effects of a strengthening El Niño caused widespread flooding. Major landslides and bridge structural damage closed many of the roads on the eastern side of the continental divide (including access to Arenal from the capital). The beaches and lowlands have high temperatures in the low nineties and low temperatures in the upper seventies or low eighties. A week or two of temperatures in the mid nineties is possible at low elevations and especially on the Nicoya coast during July. Three thousand feet higher around San José and the Central Valley temperatures are 5-10 degrees cooler and temperatures at high elevations (Monteverde and Chirripo) can be 20 or even 30 degrees lower. The higher you go the more it cools off at night so if you’re looking for some relief head to the mountains. July has grown immensely in popularity in the past few years and now rivals December, January and March as the most popular month to visit Costa Rica. Advanced reservations are recommended for northwest Guanacaste, Nicoya and central beach and volcano destinations although if you arrive early in the day and are flexible about where you end up staying you probably will be able to get a room as a walk-in at any except the most popular hotels. With increasing popularity “low season” discounts for July are pretty much a thing of the past. One thing that can still be a great deal in July is airfare. Especially if your travel dates are flexible and you can fly on weekdays last minute sales (2-12 weeks in advance) have been fairly common for the past few years. August is quite similar to July – it has similar weather (slightly wetter), the big surf swells, and slightly fewer people. May, June and November are also alternatives, each with a little more rain but even fewer people. Winter School Holiday—The “Winter” break for public schools is typically the first two weeks in July (2nd through the 17th in 2018) and families often vacation then making the beaches more crowded. NOAA projects that 2019 will remain an El Niño Southern Oscillation year through July with slightly drier than normal weather on the Pacific side of Costa Rican and slightly less predictable weather on the Caribbean. approximate exchange rate ¢622 per $U.S. Fourth of July – It has nothing to do with Costa Rica but there are a lot of expats in the beach areas and Ticos love an excuse for a party.